Germinating your cannabis seeds is one of the most thrilling and yet intimidating stages for the new grower. Let's examine the options for germination. This method starts your plants with a major setback, and most times is a waste of time and energy. That tiny sprouted root is covered with microscopic filaments that are easily damaged. There can be a significant loss of seeds, as weather changes and moisture fluctuation will affect the sprouting process. Maintaining even moisture and warmth is essential. Some people have success by inserting the pot or seed tray into a plastic bag with a few small holes poked into the top and sprout their seeds in a warm sunny spot, opening the bag once sprouted to prevent cooking the plant. Our seed starting kits simplify the germination process and provide your plants the best beginning for a healthy growing season and a bountiful harvest. EASY START pots with a water reservoir to help maintain even moisture. The seed sprouting tray will hold up to 20 seeds. 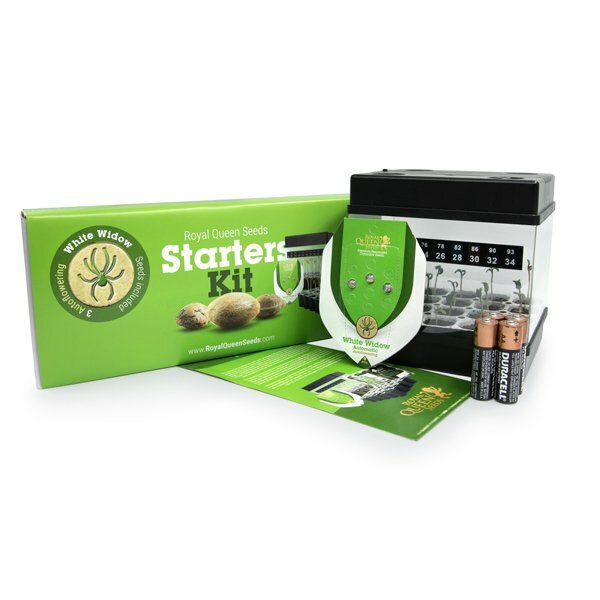 THE STARTER KIT provides the Bacto seed germinating enzyme, seed sprouting tray, and the water reservoir. You will need to provide the seeds and pearlite along with a propagator. Gently remove the foil from the back of the seed packet. Don't risk damaging your seeds by pushing them through the foil. Set the seeds in a dry container, and then set them aside. Next, measure out a liter of lukewarm water 25 degrees Celsius or 77 degrees Fahrenheit into a shallow container large enough hold the seed tray and dissolve the Bacto enzyme packet into the water. Set the seed tray into the water and allow it to soak. Using a pre-marked poking utensil, poke the pre-marked niches in the seed pots to the depth of 5 to 10 mm, then insert your seeds into the holes and cover them with the potting mixture. Sprinkle a 15 mm or ½ inch layer of pearlite into the bottom of the water reservoir and add enough of the Bacto mixture to cover the bottom of the reservoir, but not to the top of the pearlite. The idea is to keep the potting medium moist, but not waterlogged. Place the seed tray into the water reservoir, and then both into the propagator or plastic bag. Turn the propagator on, or place the bagged seed tray in a warm spot. Check the moisture level in your water reservoir once a day. Once the seeds have sprouted in one to seven days, let the seedling reach about 3 mm before transferring them to their final growing medium. If you still have any troubles germinating your cannabis seeds, please check our Grow guide about: Why don't my cannabis seeds germinate? Starting cannabis seeds can be the most nerve-wracking part of the whole cultivation process; but we're taking all the guesswork out of it with our new Starters Kit.